November 4, 2016  Consider yourself a Deadhead? Here's a list of contemporary artists that require your attention. July 27, 2013  Raised in Alabama and based in Brooklyn, Phosphorescent's Matthew Houck makes moody, searching, pretty music. 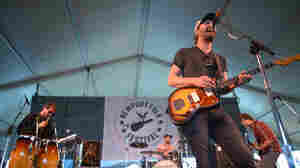 Watch Phosphorescent perform "Ride On/Right On" at the 2013 Newport Folk Festival. May 8, 2013  Singer Matthew Houck shares intimate, country-tinged songs from his band's latest album, Muchacho. April 27, 2013  Don't let their stoic demeanor and sunglasses fool you: Matthew Houck and his band know how to wring every ounce of emotion out of their music. Watch Phosphorescent perform one of its best songs. March 27, 2013  The new video for Phosphorescent's "Song For Zula" wraps metaphorical chains around a story of heartbreak. 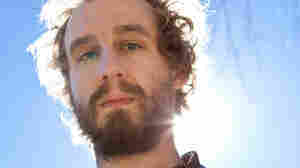 March 3, 2013  Even when it aims for celestial bliss, Phosphorescent remains rooted in dusty, personal, earthbound concerns, thanks in large part to the winningly roughed-up, beautifully human voice at its core. September 1, 2011  Phosphorescent's Matthew Houck specializes in a sort of free-wheeling weariness, with songs and characters that work extremely hard at taking it easy. 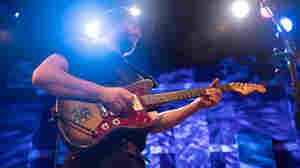 December 3, 2010  WXPN's World Cafe presented more than 200 studio sessions this year. For his year-end list, host David Dye combed through the tape and selected his five favorite songs from the many performances. Listen to the best of the best, and even download them for good measure. August 26, 2010  Brooklyn songwriter Matthew Houck writes music perfect for the back porch. His new album, Here's to Taking It Easy, takes the outlaw vibe of Willie Nelson, dials back the twang just a bit, and finds the sweet spot between country and rock. 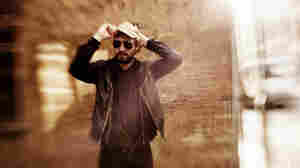 May 17, 2010  Matthew Houck has been called the pilot light for the Brooklyn-based band Phosphorescent, an indie-folk and rock outfit whose music has been described as "celestial country." He is currently touring to promote his sixth album, the little-bit-of-everything Here's to Taking It Easy.